Who Do You Think Should Play Valentina In The 'Darna' Remake? There's only one way to know: See the contenders wearing the villain's iconic headpiece! There was much fanfare before and after the official announcement that actress Liza Soberano would be playing Darna in the latest big-screen installment directed by Erik Matti. Still, fans are left in the dark when it comes to the actress playing Valentina, the archenemy of the Pinay superhero. Valentina is characterized as a beautiful woman with one physical "quirk" (if you can call it that)—she's got little serpents on her head in lieu of hair. The actresses who were tapped to play Valentina in past Darna films and TV incarnations include Celia Rodriguez, Pilar Pilapil, Pilita Corales, Alessandra de Rossi, Iwa Moto, and Jodi Sta. Maria (Valentina's origin story in Komiks Presents: Valentina). 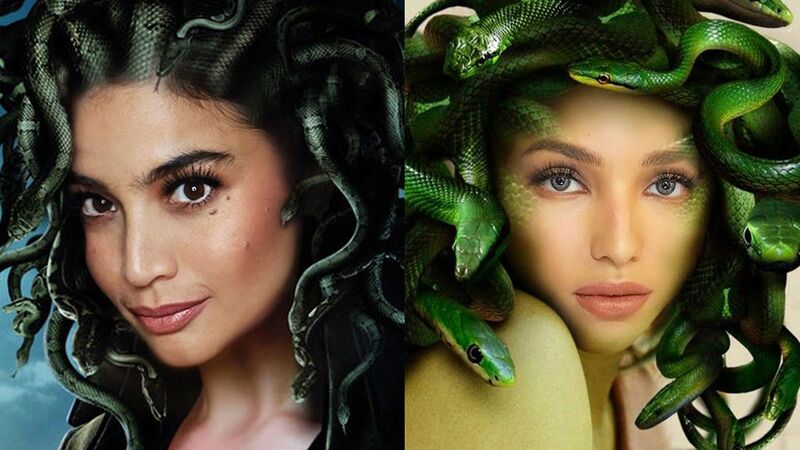 This time around, the rumored frontrunner for the part of Valentina is Anne Curtis, with Sarah Lahbati's name also popping up as another option. With the Valentina casting buzz heating up, we thought we'd present some possible contenders for the much-coveted role. The best way to pick? See the actresses in the villain's headpiece, of course!